Hi everyone! 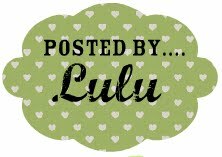 Welcome to the second week of Lulu's Sizzlin' Saturday! I hope you read about the delicious Strawberry Soup and decided to join me for some more summer treats because this week we are serving up some Delectable Deviled Eggs! If you don't have a deviled egg recipe that you love then give this one a try! Remove the yolks and mash. Then add all the ingredients and mix well. Fill eggs and sprinkle with paprika. 1. Place eggs in a single layer in a saucepan and cover them with about 1 inch of cold water. 2. Bring the water to a boil, cover tightly, and remove from heat; let stand for 20 minutes. 3. Transfer eggs to a bowl of ice water and let stand until completely cooled.